U.S. Geological Survey map shows the location of the earthquakes. A cluster of small earthquakes in Imperial County Saturday shook the Ocotillo Wells community in San Diego County. 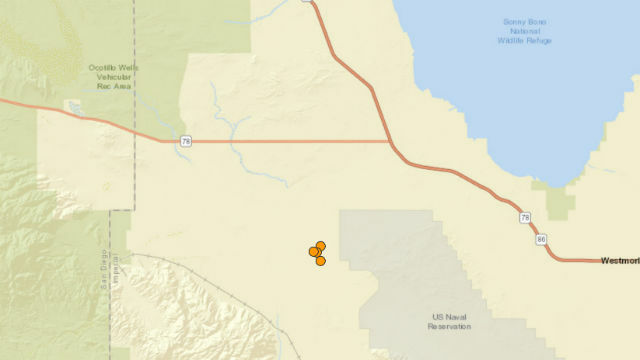 The first earthquake was a magnitude 3.4 at 5:28 p.m. and was 6 kilometers deep about 14 miles east-southeast of Ocotillo Wells, according to the U.S. Geological Survey. That was followed by a 3.5-magnitude earthquake at 5:34 p.m., a magnitude 3.1 at 5:37 p.m. and a magnitude 3.3 at 5:48 p.m., the USGS said. The earthquakes were all considered small and the 3.5-, 3.1- and 3.3- magnitude quakes could be aftershocks of the 3.4-magnitude earthquake, seismologist Jana Pursley, of the USGS, told City News Service. None was strong enough to cause damage, Pursley said.